An exciting first day. 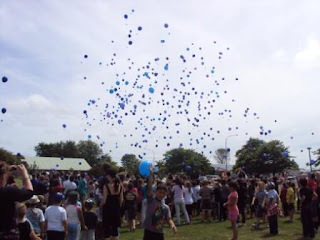 Make a wish for learning was a feature today, with students releasing over 450 balloons into the sky containing their wish for the year. Along with making a wish we were busy discovering what it is to be digitally safe and how we were going to work as a team together. Hi Digi Donuts...Wow! it was great seeing all the wishes flying into the sky. We are looking forward to discovering what we can do this year and enjoyed making our wishes. We hope your wishes all come true.. I reckon the rules are fair especially cause we, the students, came up with them. The rules are awsome and i agree with them. It was awesome and so cool. I know that my wish will come true. We need to do it again sometime. WoW!!!!! Awesome day 1 went so fast! over 450 dreams to complete .Go forward and complete them roslyn students your all capable to reach the sky. What an awesome sight to see all those hundreds of balloons floating over palm nth looked like great fun, hope all your dreams and wishes come true.